Do you plan on growing a few plants outdoors this year? Then take a look at our Top 5 cannabis strains for outdoor growing – you’ll achieve high yields at low costs. If you haven’t thought of an outdoor grow for this season, it’s about time to do so. Outdoor growing is an extremely rewarding process and usually worth it due to a very beneficial ratio between initial costs and final yields. Many of Royal Queen Seeds’ varieties show very good results when they’re grown naturally under direct sunlight. However, the particular strain you’ll choose does have an impact and can determine success or failure. We decided to put together a Top 5 of our strains that are suitable to be grown outdoors and finish by the end of September at the latest. By choosing either one of these strains, you’ll have high chanced to avoid unnecessary trouble with autumn rains in October. While other growers are still busy inspecting their buds for mould, you’re already done with the entire process and filled up all your curing jars. If you missed out on our Top 5 strains for colder and warmer climates, feel free to give those a quick look as well. Let’s start off with Honey Cream Fast Flowering, one of our recently updated favourites. This variety is becoming more and more popular in Spain due to its sweet, creamy aromas but is suitable to be grown anywhere in Europe. The flowering period is remarkably short with 6-7 weeks allowing the cultivation in regions where climatic conditions shift rather early. However, July and August usually provide a sufficient time window for Honey Cream to receive a lot of sunlight, giving growers the chance to harvest good amounts of sweet-fragranced, potent buds in September. Besides a short flowering period and amazing flavours, Honey Cream convinces with a solid Indica background consisting of BlueBlack (Blueberry x Black Domina), Maple Leaf Indica (100% Afghan Indica), and White Rhino. These three strains give Honey Cream mostly Indica genetics, but there’s also a decent amount of Sativa potency left from White Widow, the predecessor of White Rhino. When things go well, plants reach outdoor heights of 180-250cm and yield up to 675g per plant. Speedy Chile is the next of our Fast Flowering varieties and a very good choice for outdoor growers. This strain combines Green Poison and several Chile Indica landraces, although a third-generation autoflowering plant is partly responsible for an incredibly short flowering time of 6 weeks (42 days!). Don’t be confused; Speedy Chile does not carry the autoflowering trait and remains a feminized strain that flowers depending on the amount of light hours per day. One could say that Fast Flowering strains are the next breeding evolution since autoflowering genetics – these strains produce higher THC levels while maintaining an incredibly short total crop time. Outdoor growers and novice cultivators come to an excellent decision when choosing Speedy Chile Fast Flowering for their next grow. Fully mature buds can be harvested in early September, leaving not the tiniest bit of room for uncertainty regarding climate or mould issues. You’ve probably already come across Critical in your career as a hobby grower, a true heavy-yielding champion we recommend for indoor and outdoor growers seeking one of the best ratios between yield and flowering time. Critical, which also made it into our Top 5 For Colder Climates, is a vigorous and rapidly flowering Indica that deserves to be in every single ranking on cannabis strains that exist. However, crossing Critical with the notorious OG Kush took potency to a whole new level. Critical Kush features some of the cerebral and rather Sativa-like effects of OG Kush, in addition to the powerful couch-lock stone of Critical – a classic scenario of “buy one high, get one free”. Growers looking for a sturdy, potent, and heavy-yielding strain for the outdoors won’t make a bad decision with Critical Kush. The rewards you’ll receive in late September are huge; Outdoor yields of up to 550g per plant, long-lasting effects of sheer intensity, and a final product with average THC levels of 20%. Special Queen 1 is Royal Queen Seeds’ classic Skunk. It’s suitable to be grown outdoors in many different environments, also in colder climates of Northern Europe. Novice growers among our customers achieve very good results with this balanced Indica/Sativa hybrid, just like experts who seek a reliable, stable, and competitively spiced Skunk variety. Special Queen displays great vigour throughout the entire season and grows huge outdoors, sometimes exceeding outdoor heights of 220-270cm in good conditions. Outdoor yields of up to 550g per plant will be the reward for growing this queen, and she’ll be ready for harvest in late September. The decision to grow Special Queen is not a hard one to take. This strain is one of the best options for growers who want to reduce the risk of choosing a strain that is not robust enough for the outdoors. Skunk laid the foundation for a large percentage of today’s varieties for a reason – it’s simply one of the best and most stable strains that ever existed. 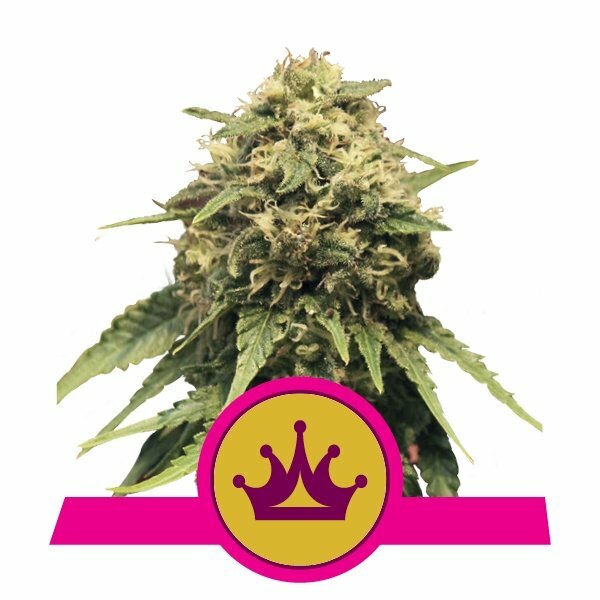 Royal Domina is a potent Indica masterpiece created by crossing Black Domina with the exotic genetics of Kalijah. This strain stays comparatively short outdoors, growing into average outdoor heights of 140-180cm. At the same time, Royal Domina yields up to 600g per plant and can be harvested by late September to early October, depending on the climatic conditions throughout the season. Additional key features of our Royal Domina are enticingly sweet aromas, an impressive resin production, and high THC levels of 20%. This strain is perfectly suitable for Indica lovers and will be an excellent choice for anyone who desires to harvest large, heavily fragranced blossoms with a thick layer or frosty resin. Many growers know about the qualities of the infamous Black Domina but we believe we’ve created something even better – Royal Domina is more classy, has an improved flavour profile, and is at least equally good at forcing bodies and minds into a state of deep relaxation.